Piggies plot a peculiar path. Two little piggies run amok on the farm, as they travel from the pumpkin patch, through the garden, into the black bull's pen, and back to mama pig in time for a nap. The piggies' antics introduce young readers to prepositions of direction. Alliteration, assonance, and rhyme in each of the three stanzas make for a great read-aloud. Mary Peterson has illustrated many books for children, including OCEAN SOUP, WIGGLE AND WAGGLE, NO TIME TO NAP, and CAT ON WHEELS. Mary lives in Los Angeles, California. Jennifer Rofe is a children's book agent living in Los Angeles, California. 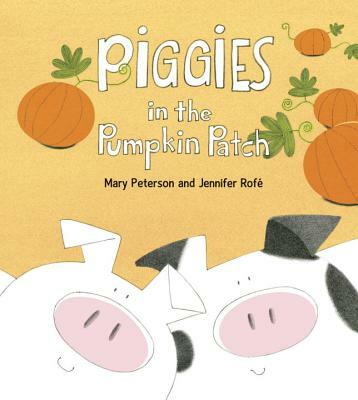 PIGGIES IN THE PUMPKIN PATCH, co-authored by Mary Peterson, is her picture book debut.